Of course there’s always loads of things to do when you return from trips, which has kept me pretty busy since Tuesday. There was grocery shopping and laundry as well as bookkeeping and sales taxes to file. School for the children gets done somewhat while we are gone but I have to get them back on track with subjects they can only do when I am here to work with them, like Science and History. We study and read these aloud together; that is my elementary aged ones. I only have one high school aged child at the time and he is independent, well sort of. He is held accountable periodically. :-) But I digress. So somehow I was able to squeeze in some knitting and have been faithful to my Sticks and Stones and cast on for the final piece. What you see up above is an assortment of other present and near future projects I have planned. This is what you call an impulse cast on. It is a Plain Jhayne in the smallest size in my Classic Merino Bamboo. I had this 25g ball of Classic Merino Bamboo that came into being when we were dyeing yarn last month. Notice how it is a multi colored dye job? We don’t dye hand painted color-ways on Merino Bamboo but when the bases were being made into skeins some Merino Bamboo base was accidentally tied onto a skein of Merino Superwash Sock yarn. 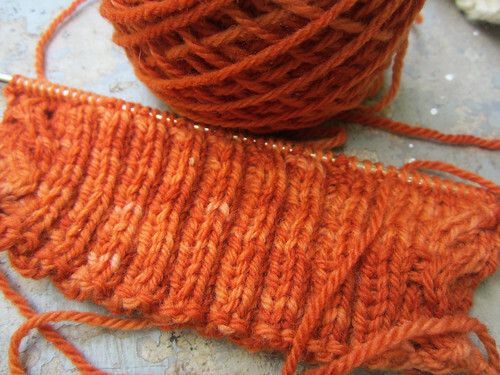 I didn’t notice it in the un-dyed skein but once the dye was set it was obvious. 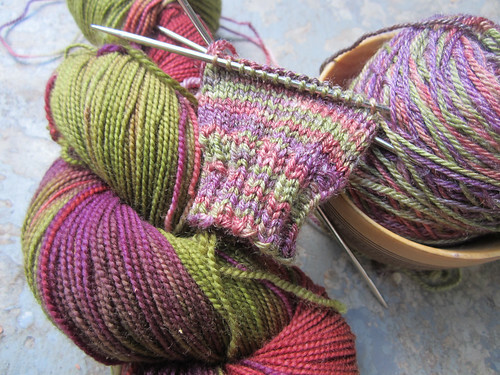 So I separated the bases out and thought to myself “I wonder how this looks knit up?” It was about enough for baby socks I thought, or hey what about fingerless mitts? Bingo! Plain Jhaynes it is. I like how it looks but if you look at the rest of the skein in the Superwash Sock yarn, you can really see how different they look. It’s okay on the Merino Bamboo, but not really worth the extra work that hand paints require IMO, which is why we only dye solids commercially in that base. But hey maybe that’s just my perception. What do you think? This project was another spontaneous cast on. 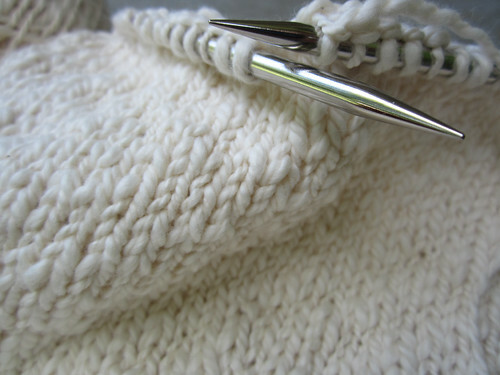 Anne Hanson emailed me about a baby project she is doing and wanted to know if I would like her to highlight my Organic Cotton as an alternate yarn choice for it. So I am working up a sample for the photo shoot which I can then use as a model in my booth. There will be more details when she releases it in early September. Now these skeins are all wound up and waiting patiently to be cast on as shawls. 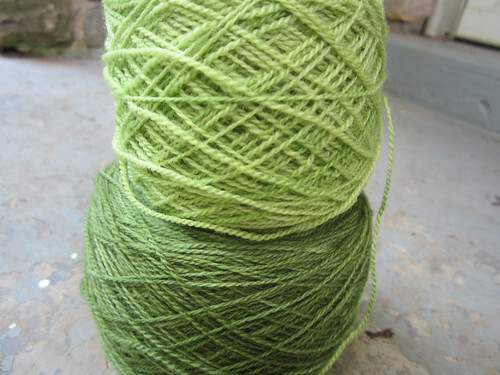 The light green is my Merino Lace in my new color Peridot, which will be a Twig and Leaf. 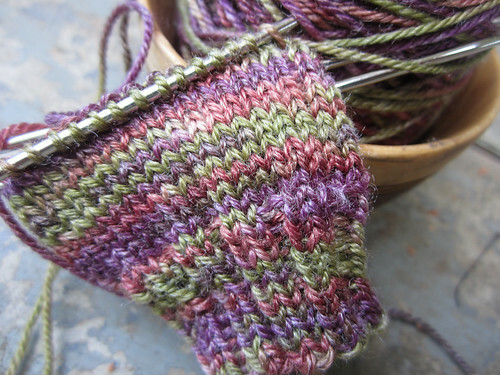 The bottom skein is the color I dyed for the Knitspot Fall in Full Color club this year. I can talk about it now since my yarn was for the first shipment and it is now in the hot little hands of the clubbies. :-) The design is a beautiful shawl called Sonneblume. I was floored when I saw it. It is so gorgeous! Anne hasn’t posted any pictures of it publicly so I don’t think I can post any but I think it’s okay if I blog my knitting progress. 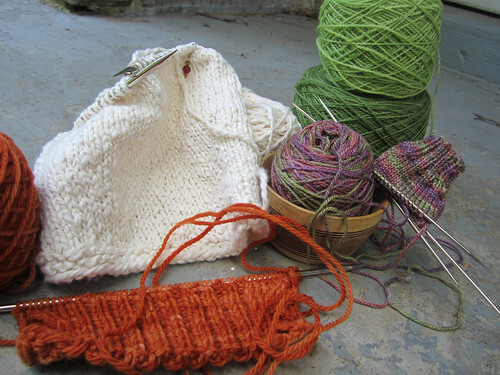 It’s a bit complicated to get going on because of the provisional cast on and all, so I haven’t gotten it done yet. I don’t do those very often so I always have to go looking for a video when I am ready to cast on. I haven’t talked about any books for awhile have I? Let’s see, what have I read since my last mention. I remember sharing my review of Horns by Joe Hill. After that I started his collection of short stories called 20th Century Ghosts. I am 62% done with it and it is very good. I like reading short stories for a change of pace in between novels. I also listened to Light in August by William Faulkner while on my trip. It was okay but to be honest I was just slogging through the last 2-3 hours. I don’t think I care for his style. I didn’t care about any of the characters and sometimes I would be momentarily confused about which characters were even speaking. It’s probably just me but I didn’t connect with him as an author, you know. I feel like that was my first and last Faulkner book. I have been on a long jaunt of contemporary writers and I feel a Classic period coming on. I have the Haunting of Hill House on my short list and after that I am torn between a re-read of The Hobbit and The Lord of the Rings or a Russian literature binge. I read a forum on Goodreads called Reading the Classics and the current read is Anna Karenina. I have read it before and while am not re-reading it now, I have been lurking on the discussion threads. Anyway I caught wind of a discussion on translations and War and Peace was mentioned. Apparently there was a highly recommended translation recently released that I wanted to have a go at. I tried once many years ago to read W & P, but it was too difficult to get into. I am hoping that was partly a translation issue for me and I am looking forward to giving it another shot. The one I will be reading is the one by Pevear/Volokhonsky. They are a English/Russian husband and wife team and are getting good reviews for their works. If this goes well I am determined to have a third run at The Brothers Karamazov too. Oh and I almost forgot the other thing that I am ridiculously excited about. The War and Peace translation left all of the French parts un-translated. I took two years of French in high school but my French skills were never anywhere near fluent and are decidedly more rusty now, so I was going to get a French/English dictionary. In Googling for a good one I ran across an app that is even better. It will translate like 11 or 12 languages from text or speech. How freaking cool is that? God, how did we get anything done without apps and the internet? LOL! Okay I have yammered on long enough for now. Until later!